Willebrord Jan Frans Maria Vandersteen was born at February 15, 1913 in the Seefhoek, a district of Antwerp. From his earliest years on he posessed a fast amount of fantasy. On the street he told his friends stories that he had made up by himself, accompanied by drawing which he drew on the pavement with chalk. At school Willy couldn't keep his attention with the lessons. After his time at primary school, which he attended at the St.-Eligiusinstituut in Antwerp, he subscribed, at the age of thirteen, for an evening-course of sculpture at the Antwerp Academy of Fine Arts. During the day he studied with his father who worked as a sculpture and ornamentist. In all kinds of weather Willy had to work at the scaffoldings to perform his craft. In 1928 he became a member of the scouts movement. An organisation which he kept feeling bonded with during the rest of his life. Even in 1988 this attachment led to him making a Suske and Wiske album, De wervelende waterzak from which part of the profits were destined for special projects of Scouting in Flanders and The Netherlands. Building style changed in the thirties. Architecture became more sober and the need for ornamentists rapidly decreased. To prevent unemployment Vandersteen worked a lot of different jobs in those days. One day he became window-dresser at the department store Innovation. Someday, while he was dressing a window he happened to lay hands on an American journal that he browsed through to see if he could find some ideas for the arrangement. The story doesn't tell us if the window became fine but it's a known fact that Willy saw an article in the journal entitled "Comics in your life". Reading that article made that Vandersteen wanted to become a comic book artist. In the personnel magazine of the warehouse he drew one of his first comics: Les péripéties de Kitti Inno. World War II has had a major influence on the career of Vandersteen. Because American comics, which until then appeared in the newspapers, couldn't be published during the years of war publishers in Europe started looking for talent from their own countries. Willy grabbed this opportunity with both his hands. In those years of war he took the first steps to become an independent comic book artist. Comics like De lollige avonturen van Pudifar, Thor de holbewoner, Sinbad de Zeerover and De avonturen van Piwo het houten paard were created. At the end of the war he created his most famous and most successful comic: Suske en Wiske. The first episode of this strip was printed in "De Nieuwe Standaard" of March 30, 1945. Only, the title wasn't "Suske en Wiske" but "De avonturen van Rikki en Wiske" (The adventures of Rikki and Wiske). The publisher had changed the name of Wiskes brother on his own accord. (A publication in a new magazine De Tuf Tuf Club showed this story which was the traditional story for many years is incorrect. Willy Vandersteen did choose the name Rikki). Since Vandersteen wasn't completely happy with the character of Rikki (who looked too much like Tintin and was too old to be a fitting opponent for Wiske) he let him disappear at the beginning of the next story (Op het eiland Amoras). It was in this second story that Suske made his first appearance. His meeting with Wiske would turn out to be the start of one of the longest running and most popular comic strip series of Europe. An important contribution to the success of the series was also supplied by the appearance of Lambik, as blundering "plumber/detective" in the third story (De sprietatoom). Vandersteen later mentioned that many aspects of his own character could be found in Lambik. The regular cast of the series was completed when the superstrong Jerom made his debut, as a secret weapon, in the story De dolle musketiers. After being turned into a friend by Wiske and, especially, Schanulleke, he stayed to become a regular player in the series. Further development in the career of Vandersteen was achieved when he was asked by Hergé, the spiritual father of Tintin, to make stories for the Flemish edition of the magazine Tintin, which wasn't very successful at the time (1948). Hergé made the condition however that Vandersteen should adjust his drawing style, which he judged to be too popular, to the style of the magazine. The cooperation between the two grand-masters of the European comic strip led to some jewels in the works of Vandersteen. 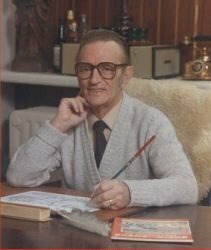 Overall he drew 8 Suske en Wiske stories for Tintin, nowadays known as De Blauwe Reeks (The Blue Series), and besides two episodes of Tijl Uilenspiegel and many pages of the stop-comic 't Prinske. Hergé was so impressed by Vandersteen's work that he once called him "the Brueghel of the comic strip". Apart from the Suske en Wiske stories Vandersteen, in this early stage of his career, drew many more stories in a multitude of genres. The styles varied from realistically drawn SF-comics like Marscommando's op aarde to charicatural series like Het Plezante Cirkus and De Vrolijke Bengels. A series that certainly must be mentioned is De familie Snoek. The experiences of this family were very popular during many years and are a good example of the typical humor of Vandersteen. In 1951 a new successful and long running series was started. Together with Karel Verschuere Vandersteen designed the comic Bessy. This collie's name was actually intended to be Lassie, like the dog in the movies that were very popular in those days. But in that case he had had to follow the scripts of the Lassie-films, which were too limited for a long running series, so Vandersteen decided to use a different name. The adventures of the dog Bessy and his boss Andy were quite popular. Especially the people in Germany liked them a lot. This international succes was the cause for the founding of a special Bessy-studio. This studio took care for a continuous flow of stories for the German market, at a certain time they had to deliver a story each week. This mass-production was the reason for there being published over a thousand Bessy-stories in Germany. The best of those adventures were translated and edited for the Dutch-languaged market. the major part of the stories however has never been published in Dutch. Willy Vandersteen used the aid of a drawing studio for more projects than just Bessy. Already at an early stage he felt the need for employees who could take over part of his work. Because he continually made up new series and stories he sometimes had to work at for or more productions at the same time. This was too much asked for, even for such a hard worker like Vandersteen. In general he let series, which he himself had created and taken care of for the first few stories, be produced by his co-workers after some time. This gave him the opportunity to busy himself with other projects. Already in 1959 this way of production led to the founding of Studio Vandersteen. This studio has brought forth many talented comic strip artists. Most of them never got widely known because they had to do their job at the series under the name of the master. This series began in 1959 and is still running. The main character was based on the hero by the same name from the children's books of Leopold Vermeiren. Presently the series is being written and drawn by Karel Biddeloo who has given the stories a personal look and brought SF elements into this medieval strip. When the publication rights for the stories of Karl May got free in 1962 Vandersteen was asked by the Standaard Uitgeverij if he would like to make a comic-series thereof. At first Willy didn't think much of it but because Karel Verschuere liked the idea the series was started after all. 87 albums with the adventures of Winnetou and Old Shatterhand have appeared until 1985. Some of those stories however are identical to albums from the Bessy-series that were published in Germany. With just a few minor adjustments the stories were published in both of the series. The appearance of Jerom in the Suske en Wiske-series, in which he first came on stage in De dolle musketiers (1953), was a big success. The character of this bruiser was even received so well that Vandersteen decided to give him his own series which started in 1960. Just like Bessy Jerom was also greatly appreciated by the Germans. Analogous to what had happened with the collie this eventually led to a studio that especially made stories for the German market, at a hight pace. From 1965-1973 Wastl, the German name for Jerom brought many stories to a happy ending in his guise as golden stuntman. Also just like with Bessy the best, or perhaps it's better in this case to talk about the "less bad" stories were also published in Dutch albums. After the series had ended in Germany it went through a couple of transformations in the Dutch version before the last story appeared in 1991. 21 stories of this adventure- and espionage-series, based on the novels of W.E. Johns were created in the period 1965-1970. It was realistically styled series that ended when Vandersteen picked up the idea for yet another series: Safari. Vandersteen got the inspiration for this jungle-series while he made a trip to Africa in the late sixties. Furthermore, the stories are evidently inspired by the popular tvmseries Daktari. Like Biggles, these stories also belong to the realistic genre. From this trip, the writer took home a monkey-skull fetish. This souvenir can be seen in one of the stories, something that has occurred more often. Other series and stories also feature objects that Vandersteen brought home from his journeys. The general public however didn't like the stories very much. The lack of success made that no great number of albums have been published. During the period 1969-1974 a total of 24 albums have been printed. Vandersteen drew only the fist stories for many of the series he created, later limiting himself to the supply of scripts before he completely handed them over. His most successful creation Suske en Wiske he kept under his own control during the years. Although studio-employees were working out the stories after some time, but the scripts and initial sketches for the drawing still were supplied by himself. This situation didn't change until 1972. In that year Vandersteen started the series Robert en Bertrand, an idea that he already had been thinking about for a long time. 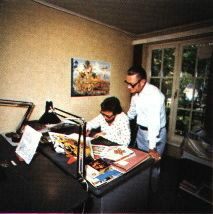 Because he wanted to put all of his energy into this new project he handed over the responsibility for Suske en Wiske to his closest collaborator Paul Geerts. He had proven, in the preceding years, that he could manage the task and up till now takes care of Willy Vandersteen's "children". In 1985 Vandersteen started his last series. This was set in the 16th century, an era that he always had amired. The title of this series is De Geuzen. The first story De zeven jagers was followed by nine other episodes before Vandersteen passed away on August 28, 1990. At his own request this series hasn't been continued by one of the studio's employees. Additional information about the Safari series was supplied by Tom Wilequet, the grandson of Willy Vandersteen.